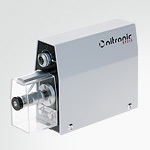 Fol­low­ing prod­ucts are avai­l­able: the new coaxial ca­ble strip­ping ma­chine ST730T, the high pre­ci­sion wire strip­ping ma­chine ST215 / ST215W and our small but pow­er­ful hand tool Min­iStrip. For spe­cial ap­pli­ca­tions we can mod­i­fy our ma­chine or tools to meet your re­quire­ments. Pro­grammable strip­ping ma­chine for coaxial ca­bles up to 7mm OD. High pre­ci­sion strip­ping ma­chine for ca­bles up to 2.5mm OD. 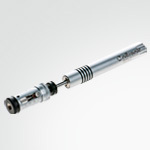 High pre­ci­sion strip­ping tool for ca­bles up to 2.5mm OD.